Many of you may be wondering what this Be Bold, Be Catholic thing is all about. In the last ten years we have continued to see a dramatic plummet in attendance and faith life in God’s people. 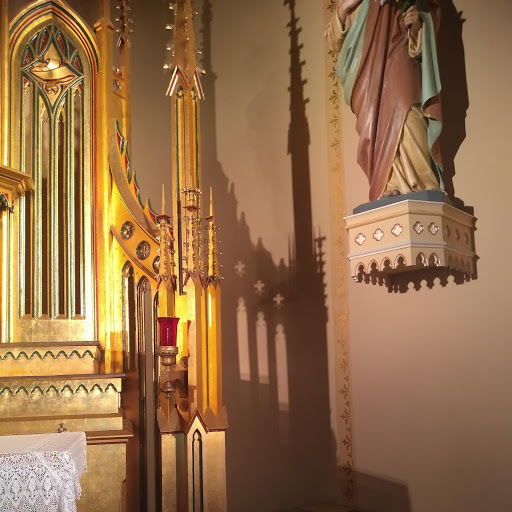 This is not something that is only happening in the Catholic Churches in Freeport, IL. This is a plummet nationwide in nearly all Christian faith communities. Particularly here in Freeport, it is taking its toll in our lives. We have so many struggles in our lives. It would be easy to fall into depression or despair going on the way we are going. The degradation of our culture into promiscuity, lies, violence, manipulation and false “fun” are the norm. The empty promises of this world are leaving us lonelier and wondering if there is anything more. We start chasing after things that only bring more emptiness and pain instead of chasing after the God that can satisfy. As Catholic Parishes, we have missed the boat on helping people through their tough times and bringing them to Jesus in these times. We have focused on doing things and on helping others, but we have forgotten that it is Jesus and our relationship with Him that really helps us all. There are a growing number of people who have no idea that a relationship with God is even possible. Moreover, that our relationship with Jesus can bring us happiness and peace. There actually is hope, but it depends on our relationship with Jesus. Because of the lack of education and inspiration, many people today have a very low level of understanding of their Catholic faith and so are easy prey for anything that would take them away from finding their fulfillment in Jesus. We need to do something about that. We cannot go on ignoring the real and basic needs of God’s people. This is where the Be Bold, Be Catholic comes in. The mission of Be Bold, Be Catholic is; “We the Catholic parish communities of Freeport, IL, commit to bring all souls to a personal relationship with Jesus Christ.” This is the purpose of Be Bold, Be Catholic. We aim at serving others and leading them to Jesus and their fulfillment. We hope to make the faith more alive and meaningful for you. We will look at all we do from the liturgy to community events to personal needs. Ultimately, we plan on serving the community at large as well. We can no longer do the same old thing. “We have always done it this way” is no longer a valid way of doing things. Every person has the basic need to grow in their spiritual life. This is what Jesus designed Catholic communities to do. The intent is to help us grow in our spiritual life. This life is a long journey, a pilgrimage of discoveries and possibilities that we may never have known otherwise. It is a pilgrimage of love, grace and fellowship in Christ Jesus. We hope that you will make this pilgrimage of faith with us. Categories: Catholic Church, Catholic Life, Fe, From the Pastor, Reflections | Tags: Be Bold Be Catholic, catholic, Catholic Church, Catholicism, Church, culture, faith, fellowship, Fr Timothy Barr, Freeport IL, Grace, hope, Jesus, life, Love, meaning, possibilities, relationship with Jesus, religion, spiritual life | Permalink.